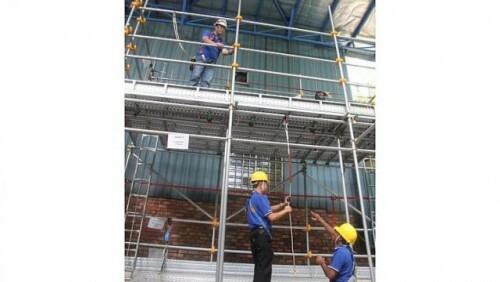 SINGAPORE - The Ministry of Manpower (MOM) has taken action against 174 companies for more than 350 workplace safety violations uncovered during a month-long operation. Officers conducted surprise inspections at 250 sites in high-risk sectors such as the construction and marine industries. In total, 108 fines of between $1,000 and $13,000 each were given to 60 work sites. Four sites were issued stop-work orders for severe violations. Officers found that safety lapses for those working from a height continue to be a concern, MOM said on Wednesday. Common lapses include open sides and openings at work areas that were left unguarded, and unsafe access to and from work areas. The ministry noted that most companies complied with requirements to implement plans to prevent falls. Mr Chan Yew Kwong, director of MOM's Occupational Safety and Health Inspectorate, urged contractors to take these processes seriously. "Falls from heights are still the leading cause of workplace deaths, so this is an area we will continue to focus on. We will not hesitate to take action against errant employers," he said. Under the Workplace Safety and Health Act, individuals that do not take reasonable measures to ensure the safety and health of every person within workplace premises can be fined up to $200,000 and jailed for up to two years for a first offence, while companies can be fined up to $500,000.